On May 3-4, 2013, PDP’s Ballas Road’s dentist, Dr. Suzanne Watson, and her assistant, Renita Valenzuela, volunteered at the Missouri Mission of Mercy (MOMOM) Clinic in Cape Girardeau, Missouri. MOMOM is a charitable project of the Missouri Dental Association Foundation and helps provide free oral healthcare to patients of all ages who cannot otherwise afford care. The two day event donated $961,582 in free care with 1,777 patient encounters. Services provided included 1,165 restorations, 2,606 extractions and 633 dental cleanings. 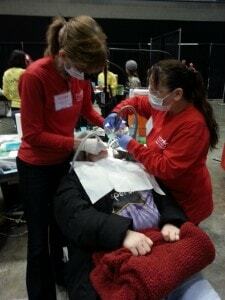 Dr. Watson and Renita were part of the 154 volunteer dentists and 128 volunteer assistants who participated in the event. Premier Dental Partners, in partnership with the American Dental Partners Foundation, recently endowed a dental scholarship to The University of Missouri School of Dentistry, Kansas City. 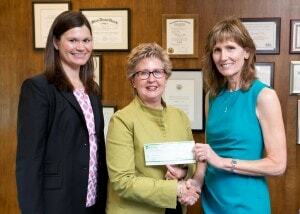 Dr. Suzanne Watson, PDP Ballas Road doctor, is pictured presenting the check to Dean Marsha Pyle. Also pictured is Anna Robinson, Director of Professional Relations, American Dental Partners and Director of Development, ADP Foundation. The ADP Foundation exists for the betterment of oral health care as a component of overall health in education, disease prevention and community patient care. Both Premier Dental Partners and the ADPI Foundation believe that investing in oral health care through dental education will help ensure patients have access to excellent dental care now and in the future.